An easy and circular cycling route around the Montes de Malaga. One of my favourites to date. It is known locally as the ‘horse-shoe’ due it’s distinct semi-circular shape – the track below ‘closes’ this circle and finishes where it starts. Although more of road bike track, it’s easily doable by mountain bike. There was very little traffic. Bar a seven-kilometre stretch that runs parallel to the high-speed road which separates Casabermeja and Colmenar, I didn’t see any cars at all. The track starts in the Polideportivo Ciudad Jardin (the sports centre). The starting place for most cycling routes to the Montes de Malaga and surrounding areas. From the Poli deportivo you make your way towards the Jardin Botonico (Malaga’s botanical garden), after crossing over the motorway you keep going straight. At the next junction, you’ll be losing most of the mountain bikers. They’ll be taking a sharp right into the forest and up one of the tracks known as the Cuesta de Presorios (affectionately known as the Cuesta de los Locos). Keep going straight, past the petrol station and eventually coming to a roundabout – go back under the motorway (following signs for the Jardin Botonical), at the last roundabout (having crossed the motorway), take a sharp right onto the road that goes downwards towards the Embalse de la Concepción. This is the old Casabermeja – Malaga road and it is a joy to cycle. Although climbing steadily for about 12kms, the gradient is fine and as mentioned above, there was so little traffic. None whatsoever. There’s a steady climb until arriving at the top part of Casabermeja. Drop down into the village and back onto the high-speed road that leads to Colmenar. This is the only bit of the route I didn’t like. Pedal hard and you’re quickly through it. Upon reaching Colmenar, follow the signs for the Montes de Malaga, turning up into the mountains. 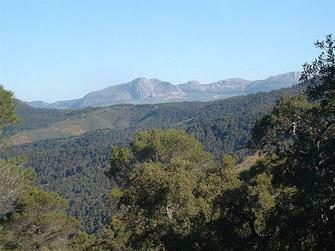 You keep climbing here until reaching the highest point of the circuit – La Fuente de la Reina at around 825m in height. There is a bar and a fountain to stock up on water or have a well earned beer. From this point onwards it’s all downhill back into Malaga city. A good 15 kms. This is the track I followed.